Through my late teens and into my twenties, my study of Mahler’s symphonies bordered on obsessive. I spent hundreds of hours listening to recordings (first on LPs and later on CDs), studying scores, reading his letters and the scant biographical and critical materials that were available at that time, and attending live performances when I could – as a singer I even had the opportunity to participate in some performances of his works. As I grew older and the focus of my musical interests increasingly expanded backwards in time to embrace the music of his predecessors, Mahler’s symphonies have remained close to my heart. It is true that while at times I have considered the extremes to which his music pushes every aspect of music-making to be self-indulgent or gratuitous, the deep and powerful emotional effect his music achieves is undeniable, and it’s influence on my life has been profound. When I began to work in my new position at the Nashville Symphony this year, one of the first things I wanted to do was to spend a week attending all the rehearsals and performances of a classical series program – vicariously experiencing first-hand the process that members of the orchestra go through each week. So the natural choice for me was to chose this week, when the symphony was performing what is still for me Mahler’s most important work, with which I have the longest and most intimate relationship. I cleared my schedule as much as I could, and in the end I managed to attend 3 of 4 rehearsals in their entirety, the dress rehearsal, and both performances. The Ninth Symphony is the last that Mahler completed. It is not his last “symphonic conception” (he drafted a Tenth) and critics have argued about whether it is or is not his “farewell to the symphony”. Mahler was diagnosed with a heart defect in 1907 and the Ninth was composed 1908-1909. When listening to the symphony it is difficult to escape the impression that Mahler was struggling with his own impending mortality as he wrote it: the turbulence of the emotions evoked by the music so strongly suggest the feelings experienced by one facing death. Mahler famously said that “a symphony must be like the world”, and the world of the Ninth Symphony is replete with an astounding variety of details – an extensive examination of these is far beyond the scope of this post. The music at turns evokes hope, despair, rage (he marked m. 174 of the first movement “Mit Wut”: “with rage”), impotence, fear, resignation, futility, sarcasm, nostalgia, exhilaration, anxiety, serenity, grief, fury, despondency, acceptance, longing, transcendence…in the first three movements the symphony careers between conflicting moods violently or expresses more than one at the same time. What impressed me most this week in my time spent with the Ninth, however, were the small melodic cells from which Mahler built the symphony. The Ninth Symphony features many themes, or melodies, throughout its four movements, which occur successively or superimposed on each other, and transform and change throughout the course of the work. These themes, in turn, are built from small melodic cells, or motives: sort of like musical building blocks from which Mahler constructs his melodies. One technique of composition made famous by Mahler’s predecessor and inspiration Richard Wagner is the use of the leitmotif, a musical motive that is associated with or assigned to a particular “extramusical” person or idea. Mahler made use of all the compositional techniques available to him and he was well known for the use of the leitmotif in his other symphonies to represent extramusical ideas. For Mahler, music was – among many other things – a language of signs and symbols. As the first movement of the Ninth begins, a few brief notes are played by the cellos and a horn followed by brief melodic statements by the harp and another (muted) horn and a tremolo between two notes in the violas. These first six measures, while containing important motives that recur throughout the movement, mostly serve here to set the tonality – the key of D major – and to orient the listener for the beginning of the first theme proper. This first theme is played by the second violins, and is developed from a two-note “falling second” motive which I believe – consciously or unconsciously – Mahler uses as a leitmotif to represent one of the fundamental emotions explored by this symphony: the yearning or longing for completion that contemplation of death evokes. This longing for completion is the fundamental theme, symbolically, of Mahler’s Ninth Symphony. The Incomplete Motive is the smallest (two notes!) and most compressed (only a step apart) motive possible – the only other motive as small and compressed would be the inversion of this motive: a rising (rather than falling) second. The emotional content of these two small motives can be revealed by comparison: with a sense of the tonic (D Major) established, the Incomplete Motive consists of the third and second degrees of the scale (mi-re), whereas a rising motive on the same two pitches would be the opposite: re-mi. Sing it! The Incomplete Motive comprises the same first two notes as the first two notes beginning the children’s song “Three Blind Mice”. Emotionally, re-mi evokes a hopeful attitude, while mi-re evokes the expectation that the Incomplete Motive will be followed by do, which will complete it. Mahler is very careful, throughout the entire course of the long first movement, never to do so. The lack of fulfillment expressed by the Incomplete Motive haunts the Ninth Symphony’s first movement, the long Andante in which Mahler presents his struggle to come to terms with the ending of all he has loved and struggled with. When not incorporated into the melodies at the front of the musical texture, the Incomplete Motive is often present in the accompaniment, as a commentary and reminder of the longing for fulfillment that permeates all of the other emotions that tumble and roar through the music. As the movement hesitantly limps to the end, the Incomplete Motive is stated three times by the oboe – pleading – and although the final note of the movement is finally do, it is played by pizzicato strings and harp (as harmonics) and piccolo, high above the octave in which the oboe plays. The oboe does not bring the Incomplete Motive to completion. The effect is that of fulfillment coming from above, and not as part of the melody itself but as something imposed on it from outside. The Turn is a motive with a long history in European art music, and in German music especially it was used as a standard ornament during the Baroque, Classical, and Romantic periods. The Turn consists of four notes used to decorate an important note in a melody. Using the steps of the scale of the key the piece is in, they are, in order: the note above the note being ornamented, the note itself, the note below the note being ornamented, and again the note itself. Its use was so ubiquitous that a shorthand method was developed to indicate a turn: this symbol looks like a stylized letter S turned on its side and inverted. A turn is usually followed by a note higher than the note it ornaments, and is often found in Classical period music (like Beethoven) at the end of a phrase shortly before the cadence. Typically, the function of a turn is to gain momentum to propel the melody to a higher note. The Turn makes its first appearance in the Ninth nearly three-quarters of the way through the First Movement, during one of the movement’s climaxes. It is one of the most vehement moments of the first movement, and The Turn is played twice in succession on a high g’ by woodwinds and strings. Mahler writes out the notes the first time it appears in m. 304 and marks it veloce – rapidly – then immediately repeats it, this time marking it with the traditional turn symbol. Mahler is using The Turn here in an emphatic manner: he repeats it again in m. 305, and then then again at the apotheosis of the climax at m. 308. Here he uses The Turn to propel the melody up a tritone at the moment in the score marked “Höchste Kraft” (highest power). 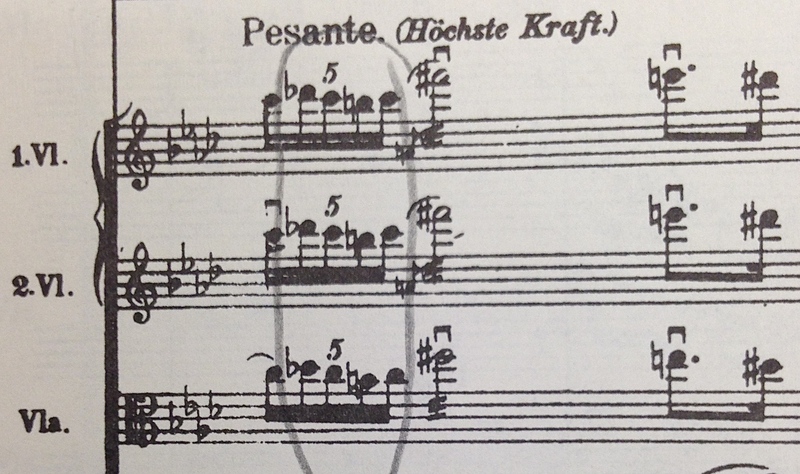 In the First Movement Mahler uses The Turn in a traditional way: to give emphasis to an important note in the melody. This can easily be seen by playing the passage without it, substituting one note (the ornamented note) for the four notes of The Turn wherever it occurs. With The Turn removed, although the passage loses some of its forceful character, the melody stays intact. Composers commonly present contrasting themes within a movement. Often these themes are described by contrasting adjectives like masculine vs. feminine, light vs. dark, bold vs. tender, etc. In the Third Movement – the Rondo: Burleske – Mahler presents a bold, at times violent series of marches which carries on at a punishing tempo for most of the movement, putting great demand on the members of the orchestra. It is in the tender theme that Mahler writes in contrast to the marches of the Burleske that The Turn now appears, no longer as an ornamental device, but as a primary feature of the melody. The Turn first appears in the Burleske as a premonition of the “tender theme” in an accusatory passage played by the 3 oboes in unison at m. 320. The measures that follow swiftly began to change character and at m. 354 the “tender theme” proper enters with a passage marked “Etwas gehalten” (somewhat holding back) played by the flute and first violins. Here The Turn is rhythmically augmented – played in quarter notes – and takes its place as an essential feature of the melody. Although the “tender theme” does not triumph, and the Third Movement ends with a sinister and brazen return to the Burleske, the listener is prepared for the serene Adagio that follows, whose melodies are completely dominated by The Turn. The Ninth’s closing Adagio opens with an ascending octave on the dominant played by all violins which announces The Turn, the dominant feature of the movement’s melody which Mahler repeats in every voice of the opening chorale and which continues to permeate the movement all the way to the end. Except for the brief secondary theme that appears for twenty bars at m. 88, The Turn is a strong feature of most phrases and played by nearly every instrument at one time or another, appearing at least 122 times during the course of the movement (in either diatonic or chromatic but otherwise unadulterated form, not counting instances when it appears in varied form, i.e. four notes with the same melodic contour but differing pitches, or the same pitches but unequal rhythms, etc.). The last page of the symphony, which Giancarlo Guerrero described to the orchestra during rehearsal as the most remarkable ending in the symphonic literature (my paraphrase), is marked Adagissimo and scored for strings only playing various degrees of pianissimo (pp, ppp, and pppp!). The final statements of The Turn are made by the violas, who beginning at m. 176 play The Turn three times with long pregnant pauses between each, and then one last time inverted. 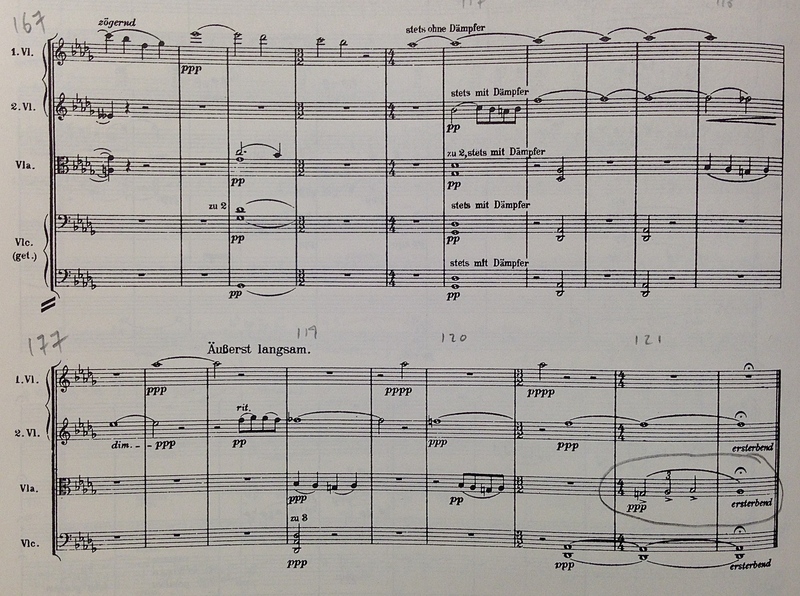 Mahler only inverts The Turn one other time in the course of the movement – played by the violins in m. 67 – and it is remarkable and dramatic that he chooses to end the symphony this way. It is remarkable and dramatic, and in the final analysis it must also be meaningful. The question, of course, is: if The Turn is a leitmotif, what does it represent? Why does Mahler invert The Turn in the final moment of the Ninth? …the function of a turn is to gain momentum to propel the melody to a higher note. There are many other elements of the Ninth that caught my attention last week: the tremendous endurance demanded by the work on the part of the orchestra, the conductor, and the listeners; the sheer virtuosity demanded of every player; the extremes of tempo and dynamics; the brilliant and unusual textures of the orchestration; the page marked Misterioso beginning with m. 376 in the First Movement, a duet for flute and horn over restless figures in the cellos and basses that has neither precedence nor is revisited anywhere else in the piece…the Ninth has many mysteries that will continue to fascinate musicians and music-lovers for many years to come. When I began to write this post – beginning this blog at long last after reaching the point beyond which I could no longer continue to put it off – I decided not to do any “research” but simply to write about the features of this symphony that has meant so much to me over the course of my life from the perspective of what occurred to me during rehearsals and performances last week. Doubtless others have ready explanations of what The Turn stands for. As far as I know Mahler never explicitly stated what it meant. Hopefully there is no final analysis – death, after all, must retain some mystery. 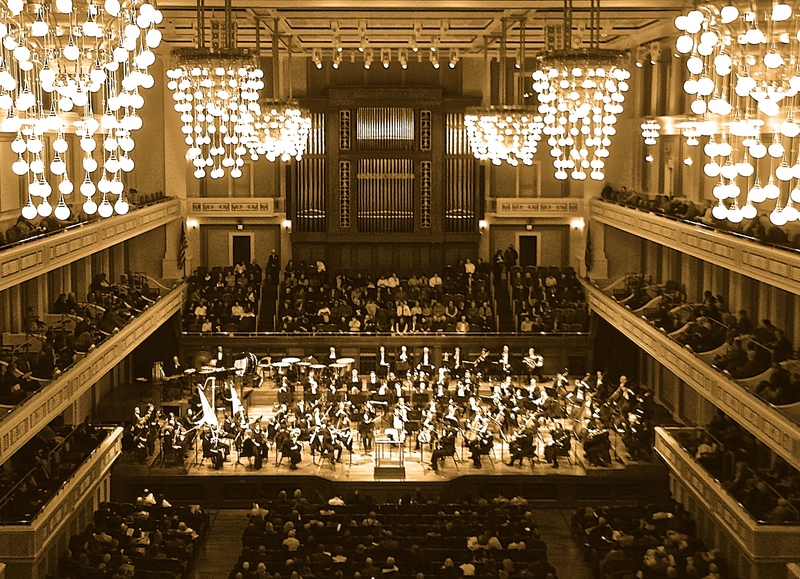 By walterbitner in Nashville Symphony, Orchestral on March 3, 2015 .
although I wish I could’ve been in Nashville to hear it myself, your interpretation of Mahler’s Ninth has me running to my iPod now and checking online for a live performance in our area! Thank you for sharing! Hi Leslie, I hope you can find a performance nearby and soon! If not, I still recommend Giulini’s recording with Chicago Symphony as one of the best – it won the Grammy the year it was released on Deutsche Grammophon. Wonderful post! I didn’t get to play one of my favorite moments this time. In th last movement, 3 oboes in unison play a rising 2nd , twice, scale degrees 5 and 6 in F# major but i am convinced in alludes to first movement. .. heart breaking. .. Thanks Roger…I’m going to look at my score when I get to the office and check this out! Thanks for an enjoyable read. I’m a longtime fan of Mahler and of this particular symphony. It has haunted me (in good ways) for many years and I never tire of hearing it. While I liked reading about the turn and other features, I was somewhat disappointed that you don’t address the opening figure of the symphony, heard in the cellos on the note A. 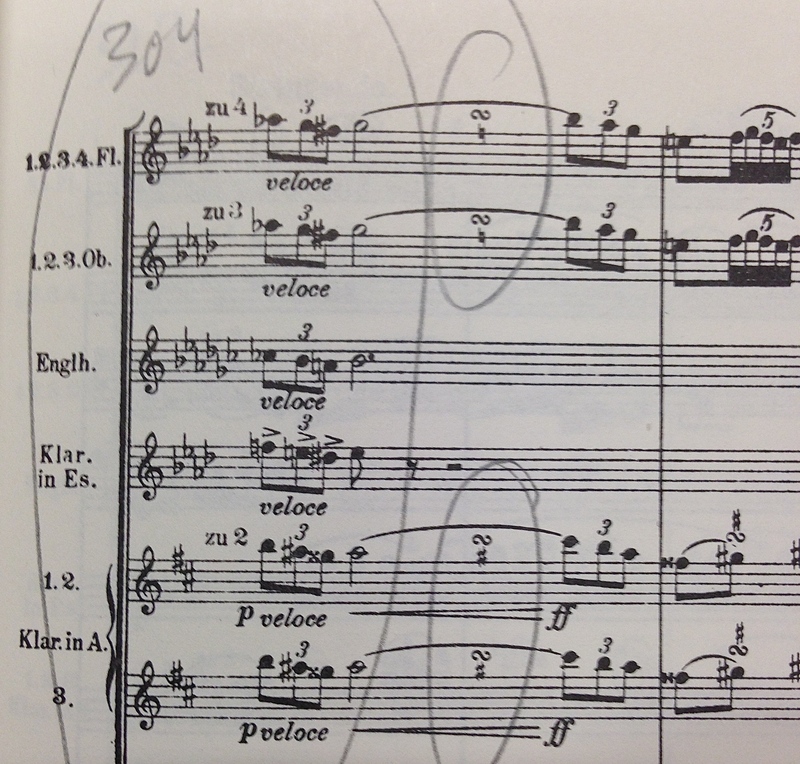 This is surely a central leitmotiv–first heard almost distantly, like a foghorn, it becomes stronger each time, and at the great climax (the one with your great description of the turn) it shatters the fabric of the music, seeming to send the orchestra scurrying in terror. Some might hear this figure as a death motif, or certainly representative of an unavoidable force. Again, I thank you for an interesting piece about this endlessly fascinating (and deeply beautiful) masterwork. You’re absolutely right, of course – thanks for bringing this up. This was my first blog post and I was feeling under pressure to write it as quickly as I could yet do a good job. I had been putting off beginning this blog for so long, and had already missed several opportunities to begin (there’s no shortage of catalysts to write about when you work for a symphony orchestra). If I ever get the chance to write a more full-fledged treatment, I will be sure to include the “faltering heartbeat” motive!